FIIA osallistuu uusiin tutkimusprojekteihin sanktiopolitiikasta ja avaruudesta ja on käynnistänyt oman tutkimusprojektinsa terrorismista. Instituutti hakee parhaillaan kahta ohjelmajohtajaa ja myöhemmin keväällä tutkijoita kolmeen tutkimusohjelmaan. FIIA jointly with the Research Institute of the Finnish Economy (Etla) are conducting a research project entitled ”Development of EU’s Sanctions Policy: Political and economic implications for Finland”. The Project is part of the Finnish Government’s analysis, assessment and research activities (VN-TEAS) for 2019, and it will run until January 2020. The aim of this project is to examine (i) the development of the EU’s sanctions policy; (ii) assess its implications for Finland; and (iii) Finnish businesses. The project will also analyse the implications of the US sanctions policy for the EU and Finland. The research project is led by FIIA’s Programme Director Juha Jokela, and it is executed jointly with Etla. FIIA’s research team includes Senior Research Fellow Katja Creutz, and Research Fellows Ville Sinkkonen and Matti Pesu. It is supported by a Senior Visiting Research Fellow Clara Portela (University of Valencia) and a Visiting Research Fellow Ilari Aula (LSE). Etla’s research team includes Head of forecasting Markku Lehmus and Researcher Birgitta Berg-Andersson. 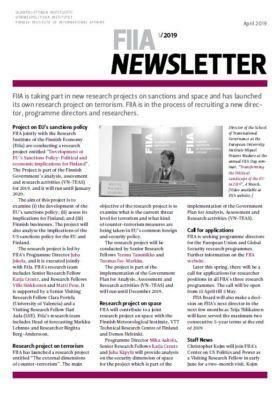 FIIA has launched a research project entitled “The external dimensions of counter-terrorism”. The main objective of the research project is to examine what is the current threat level for terrorism and what kind of counter-terrorism measures are being taken in EU’s common foreign and security policy. The research project will be conducted by Senior Research Fellow Teemu Tammikko and Research Fellow Tuomas Iso-Markku. The project is part of the implementation of the Government Plan for Analysis, Assessment and Research activities (VN-TEAS) and will run until December 2019. FIIA will contribute to a joint research project on space with the Finnish Meteorological Institute, VTT Technical Research Centre of Finland and Demos Helsinki. Programme Director Mika Aaltola, Senior Research Fellows Katja Creutz and Juha Käpylä will provide analysis on the security dimension of space for the project which is part of the implementation of the Government Plan for Analysis, Assessment and Research activities (VN-TEAS). FIIA is seeking programme directors for the European Union and Global Security research programmes. Further information on the FIIA website. There will be a call for applications for researcher positions in all FIIA’s three research programmes. The call will be open from 15 April till 5 May. FIIA Board will also make a decision on FIIA’s next director in the next few months as Teija Tiilikainen will have served the maximum two consecutive 5-year terms at the end of 2019. Christopher Kojm will join FIIA’s Center on US Politics and Power as a Visiting Research Fellow in early June for a two-month visit. Kojm serves as the Director of the Elliott School’s Leadership, Ethics and Practice Initiative in Washington DC. He re-joined the School as a Professor of Practice in International Affairs after serving as Chairman of the National Intelligence Council from 2009 to 2014. This year’s first issue of the Finnish Journal of Foreign Affairs, Ulkopolitiikka, focuses on brexit. The Journal includes a profile interview with Lord John Kerr, a former UK representative to the EU and member of the House of Lords. He recounts how the famous Article 50 was drafted at the European Constitutional Convention, where he acted as Secretary-General. The Journal also analyses the historical UK-EU relations and the role of mass media in the rise of Euroscepticism in the UK. In addition, the Journal visits Warsaw, where former social democrat, LGBT activist Robert Biedroń just launched a new political party Wiosna (Spring). Poland will have three elections within a year, and the article asks whether the country will continue on the authoritarian path. The Journal’s report from Peru shows how growing Pentecostalism has changed the political landscape of Latin America bringing conservative issues back to the table. Ulkopolitiikka is available both as a printed journal and as an online version at www.ulkopolitiikka.fi.